Production and quality processes management requires accuracy to obtain reliable and congruent data, speed and clarity in providing informations and flexibility to fit in continued changes of customer requests and technical circumstances. zProduction is designed and realized starting from factory workman needs, to simplify and integrate daily production work. Nowaday zProduction is a complete and integrated system which allows to manage all manufacturing company processes, from trading to quality, in a industry 4.0 view. The purpose is to centralise and to provide all necessary information to a correct production of each article, integrating and digitizing know-how and experience of every involved figure, from manager to production operator. Collect information in the moment and in the place where they spread is the key for data reliability. 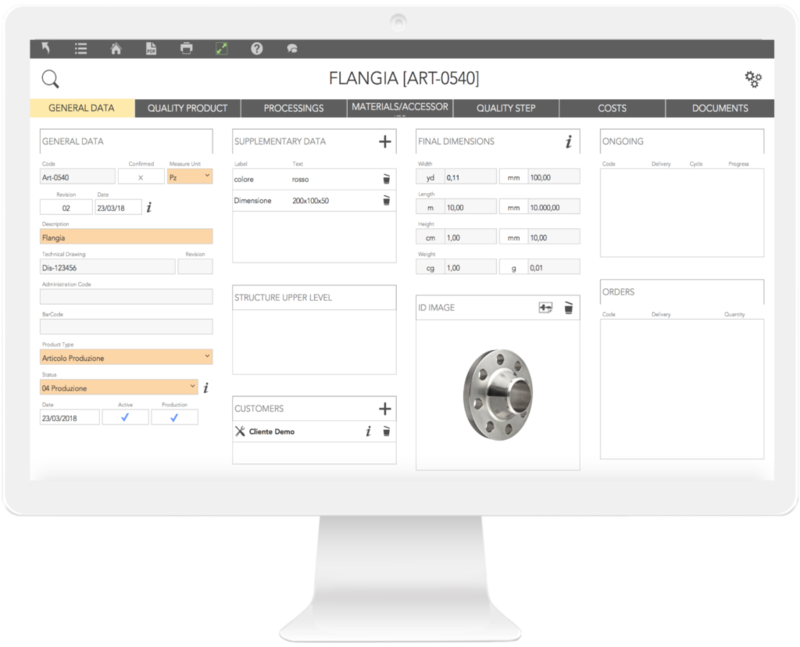 Directly collect data of production tooling, detooling, quality control, commodity and accessories consumption. All integrable with links to machinery. This permit to avoid paper sheets from factory and to distribute and share informations in real time, without time waste and mistakes. Besides, thanks to FileMaker, the platform zProduction in based on, everyone can realize report, graph and personalized extraction in total autonomy. Are you interested in zProduction? 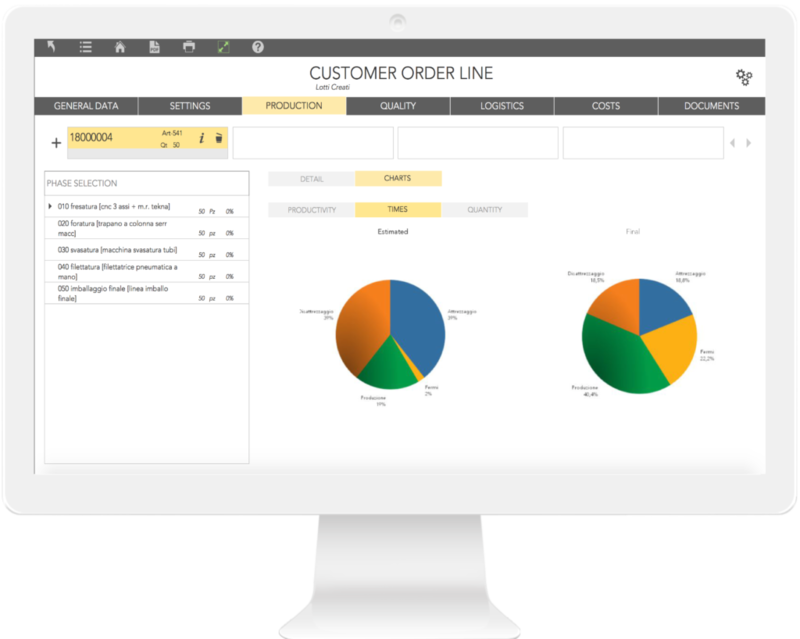 zProduction deals with every information flows and with company management and control needs in a unique, really integrated system, from production to trading, making available all data in real time and unifying in this way in just one tool CRM, MRP, ERP and MES function. The core concept zProduction was devised and realized by is that it has to be a supportive tool able to follow the evolution of the company trough the years, enlarging development and improvement possibilities. These target could be reached only with a configurable and flexible tool which perfectly fit to company necessity. The opportunity of design and customize the processes, the characteristics of flexibility, openness and speed of FileMaker platform development and the high competence of our team are the foundations to reach this target. Customer offer request is taken in charge by the salesman. Technical and quality office evaluates the feasibility and obtain various production costs for each batch. Salesman negotiates the selling price and acquires the order. Logistic evaluates warehouse stocks and prepares production orders; the system plans and returns raw material requirements on which sales office plans the orders to the suppliers. Production office records the output and all quality data, processing from contractors included, and evaluates the productivity and the respect of cost targets till the packaging. Later on logistic send it to client, attaching eventual quality certificate, satisfying the requested order. zProduction was born in production. All the system was designed caring about the needs of a practical, complete and flexible use typical of production employees. Unlike of administration area, where the ERP is the only work tool, in production are practical work tools area others so the management system should be a support and not a break. All corporate areas are integrated in a single platform allowing a full information condivision useful among different functions and a full control of work processes. All in a multicompany, multilanguage and multicurrency area. zProduction integrates with other management systems, with web services, with production and quality machinery. It guides step by step the user trough different operations thanks to a simple, clean and consistent interface and user experience, making practical use of the platform easy and immediate for any kind of user and reducing consequently times for employees training. zProduction structure is meant to fit in different specifics of any business area. Besides FileMaker platform, with which it is constructed and developed, is a RAD system which allows to realize customization and integration in extremely fast time. These characteristics permit to evolve and personalize zProduction gaining an ad-hoc system with an extremely return on investment. Make available and collect data in the moment and in the place where they spread is fundamental for the quality of processes management itself. 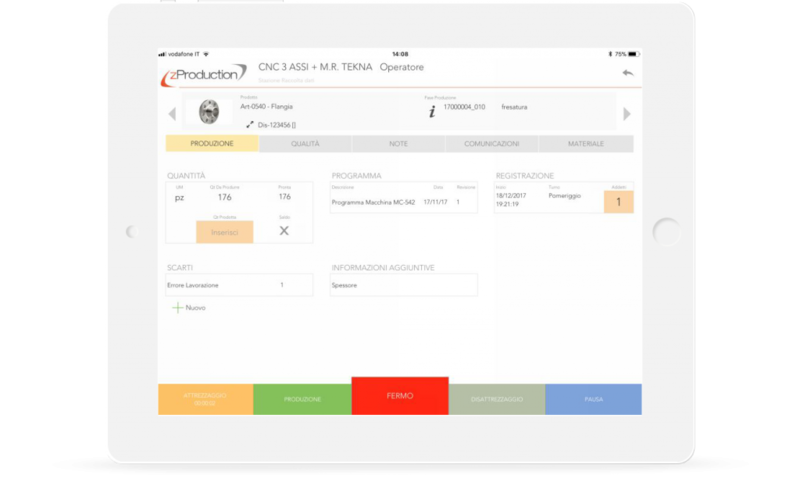 For this reason zProduction uses mobile (iPad, iPhone) and web devices and also guarantees access from the outside, to give the correct tool, with necessary data, to the right person where and when it's necessary. zProduction architecture was studied analyzing characteristics, variables and needs of everyone involved in the work processes, without blindly caring about traditional management practice only. The point of view is overturned: zProduction focuses on productive and operative necessities, to provide the supplies to the administration once needed, to operate with a full knowledge of everything that happened. To successfully introduce a management system product and service quality are essential. Our technicians are not just developers but also competent consultants on different business processes. This to better understand the needs, to design solutions in collaboration with the client and to build them, offering a all-round support. Want to know more about zPRODUCTION?